The family lineage for the Lawtons of Summer Oaks in Oviedo, Florida. This family tree begins with William Lawton, who was born in England, and continues through to the family of Betty Jean Aulin Reagan. This booklet is missing pages 2, 3, and 5. Joseph Lawton (1753-1815), the son of William Lawton of England and Mary Sams, was the patriarch that began the native-born Lawton legacy. Lawton was born on his father's Plantation, Steamboat Creek, on Edisto Island, South Carolina on October 18, 1753. By 1774, Lawton moved his family to Black Swamp, where he established a plantation called Mulberry Grove Plantation. Lawton married Sarah Robert (d. 1839) on March 18, 1773, and together they had seven children. The best-known of the Lawton family was Thomas Willingham Lawton (1882-1963). T. W. Lawton graduated from Rollins College in 1903. He later received his master's degree from Andover Newton College in Boston, Massachusetts. Following college, Lawton returned to Oviedo, where he married Charlotte "Lottie" Lee (1887-1984) and served as the principal of the Oviedo School from 1905 to 1907. In 1916, he became the first elected Superintendent of Schools of Seminole County. He held that post until 1952 and passed away 11 years later in 1963. Lawton Elementary School is named in his honor. 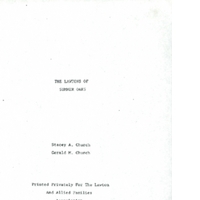 Original 17-page booklet: Church, Stacey Allene and Gerald Marshall Church. The Lawtons of Summer Oaks. Lawton and Allied Families Association, 1984: Private Collection of Betty Jean Aulin Reagan. Digital reproduction of original 17-page booklet: Church, Stacey Allene and Gerald Marshall Church. The Lawtons of Summer Oaks. Lawton and Allied Families Association, 1984. Originally created by Stacey Allene Church and Gerald Marshall Church, and published by the Lawton and Allied Families Association. Copyright to this resource is held by the Lawton and Allied Families Association and is provided here by RICHES of Central Florida for educational purposes only. "History of the First Baptist Church, Oviedo, Florida: First 100 Years, 1869-1969." RICHES of Central Florida. https://richesmi.cah.ucf.edu/omeka2/items/show/5657. Church, Stacey Allene and Church, Gerald Marshall. “The Lawtons of Summer Oaks.” RICHES of Central Florida accessed April 20, 2019, https://richesmi.cah.ucf.edu/omeka/items/show/6206.